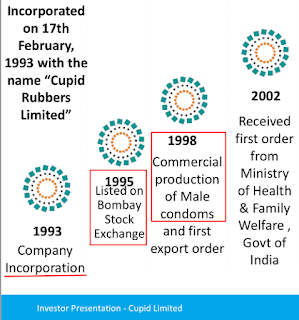 This article provides in depth fundamental analysis of Cupid Ltd, a leading Indian manufacturer and exporter of male & female condoms and lubricant jelly. I am a regular reader of your blog, which I discovered a few months ago. I especially enjoy reading your company analysis, which you do after readers submit their analysis to you. 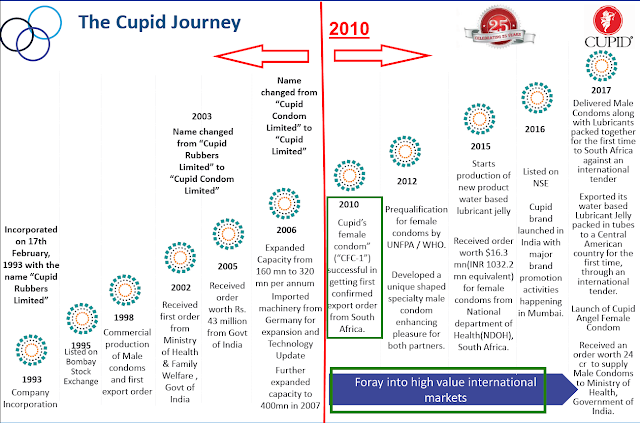 In the same spirit, I have been observing an interesting company called Cupid Ltd. I have done the analysis for this company, as I think its stock seems attractive for the long-term. Please have a look at the attached file and post your analysis on the website too. Thanks, and let me know if you need any more info. Cupid Ltd specializes in manufacturing male and female condoms, lubricants, and other products related to sexual health. It seems like the only listed company in India, which is primarily into this sub-industry of sexual health. There is no credit rating report available for this company. It is the leading company in India, which is qualified to supply condoms to UN/WHO related bodies. It is the second company in the world after Female Health Company to obtain a WHO pre-qualification for female condoms and is presently in the process of acquiring USFDA approval. Besides UN/WHO bodies, it also has agreements and relationships with governments of African states, which sanction procurement and supply of female condoms for their health welfare programs. It is also worth mentioning that Cupid Ltd has a design patent on its female condom, in which it uses a special sponge based design to improve comfort, as opposed to the standard design of its competitors. Sales have grown four times since 2008, with ups & downs along the way. However, the overall trend has been up. OPM has also increased, especially post 2014. The major reason for this increase is the fact that the higher margin female condoms were introduced around that time. Margins on male condoms are around 15%, while they are close to 50% for female condoms. Cupid Ltd has also introduced additional products like hand sanitizers, which have high margins of close to 35-40%. Hence, we see a steady rise in OPM post 2014. The tax rate seems reasonable at around the 30-35% mark. Cash flow from operations is steadily rising, and that trend has helped the company pay off its debt, which in 2017 went to zero. Therefore, Cupid Ltd as of now is a debt-free company. A note on capex is written below as well to support this argument on debt reduction. The company appears to have become more efficient, with certain expenses such as manufacturing expense as well as power & fuel having gone significantly down as a percentage of sales. This has happened simultaneously as sales have been increasing. The reduced debt has also reduced interest expense, and a net result of all these events have increased profit as a percentage of sales in a major way. Since 2008, total cumulative CFO is ₹45 crores, while CapEx has been only ₹12 crores. This gives a very healthy FCF to CFO ratio of 0.73 or 73%. In recent conference calls, the company does intend to expand its manufacturing facility by spending ₹7 crore in the coming months. In terms of USFDA for female condoms, Cupid Ltd projects spending about ₹13 crore (2 million USD) over next 2 years. Therefore, the CapEx figure seen above of ₹12 crore will certainly be much higher due to spending in the coming months. The company plans to do QIP or take on Debt for raising these funds, but it remains to be seen what it exactly does. The company also plans to spend significantly on marketing and brand promotion. It has planned to spend ₹11 crores for these activities and that will also be an added investment to the CapEx mentioned above. Still, with healthy cash flows coming in and a confirmed order book of close to ₹73 crores should make it a smooth sailing in terms of these planned expenses. Asset turnover has steadily increased over 2009 to 2017, which means the company is making good use of its fixed assets. Receivables have increased, which may cause more capital stuck in working capital requirements. This is evident from the fact that receivables, as a percentage of total assets has gone up from 3% to 19%. However, inventory is being turned more and more, with the ratio having quadrupled since 2009. Cupid Ltd is certainly manufacturing and delivering a lot more, though it is not collecting its money as fast as maybe 2010-2011 period. If compared to an FMCG company, receivables are high, but not unreasonably high. Kirana stores also require 30 to 60 days to pay for the goods. Market cap increase to retained earnings ratio is above 10, indicating strong shareholder value being created by earnings, which is not being paid as dividends, but rather getting re-invested in the company. Market cap has also grown over the 2008 to 2017 period, which shows that the market is valuing the increasing sales, net profits and higher OPM of Cupid Ltd, and its promise in the ever-increasing sexual health market. The company has been in search of a CEO for quite some time, and it still has not found one. Therefore, succession plan remains uncertain. The promoter of the company lives in New York, and recently cashed out almost 4% of his holding for purchasing a home in NY. Though not alarming, it is worth noting this point. Promoter remuneration is around 56 lakhs, which is reasonable as well and nothing to be concerned about. Overall ceiling limit is 5% of net profit. Net profit in 2017 was about ₹20 crore, so 5% is about ₹1 crore, hence remuneration is well within the limit. Other directors and management personnel have salaries around ₹5 lakh range, which is also very reasonable. Board meeting attendance fee is close to ₹2.25 lakhs. The ratio of director remuneration to median remuneration is about 19.5x. This ratio was about 14x in 2016, so it has gone up. Director remuneration increased 50% while employee average increase was 20 odd percent. In terms of domestic market, the company has started selling on e-commerce websites and is planning to appoint distributors for offline retail locations. This was mentioned in concall of May 2017. One potential threat to domestic business is the policy of Drug Controller of India. It had imposed price capping on condoms, which was challenged by Reckitt Benckiser (Durex condom) and JK Ansell (Kamasutra). The Delhi High Court ruled in favor of these companies and the condom product was not to be included in the DCI list of “essential medicines”. However, such policy decisions can have a huge impact on Cupid Ltd’s business, especially in the domestic market. Another point is about the condom market in India. It is highly fragmented and competition can put pressure on margins, as there are many well-known players with much higher brand awareness than Cupid Ltd. Thanks for sharing the analysis of Cupid Ltd with us! The time and effort put in by you in the analysis of the company are clearly visible by way of references various sources like conference calls, annual reports, learning from public documents etc. We appreciate your gesture of sharing the analysis with us. It is beneficial to the author as well as the readers of this website. 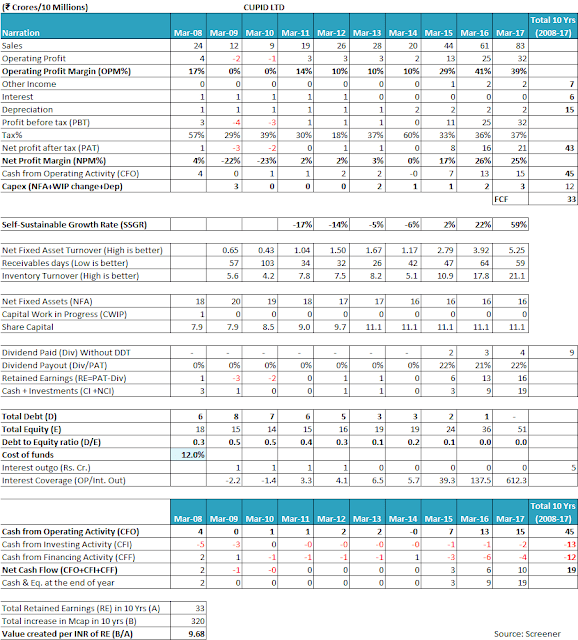 Let us first try to analyse the past financial performance of Cupid Ltd. 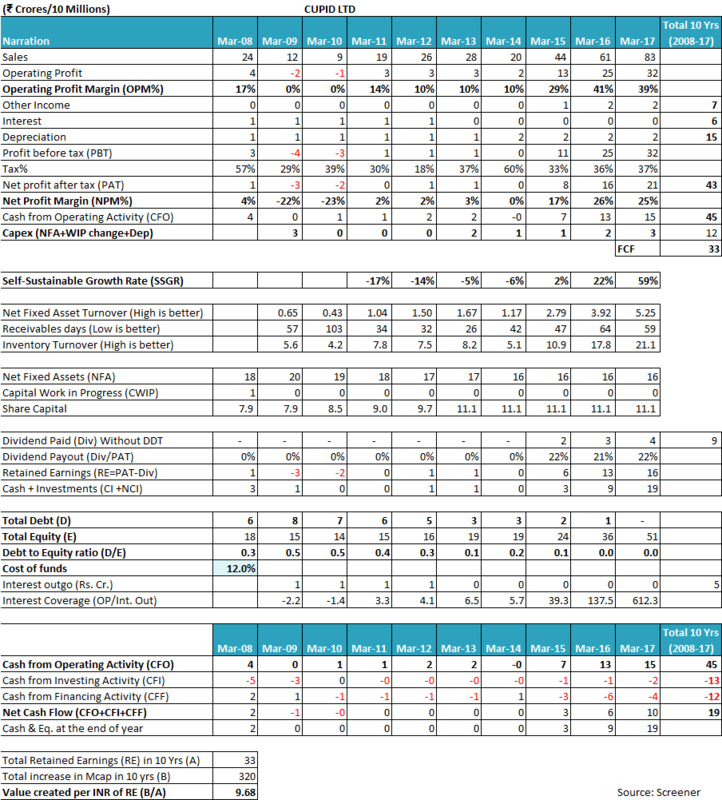 If an investor looks at the financial performance of Cupid Ltd over the years, then she would be able to notice that the past financials of the company present two marked different phases in performance. The first period is leading up to FY2010 where the company has witnessed declining sales, operating losses and sustained debt. During this phase, the company’s sales declined from ₹24 cr in FY2008 to ₹9 cr in FY2010. The company’s profits witnessed a continuous decline and it reported operating losses in FY2009 and FY2010. The company’s debt levels were sustained at levels of ₹6-8 cr. It becomes obvious to the investors that the business position of operating losses with continued pressure of finance costs would have led to a serious rethink in terms of business strategy in the company, which seems to have led to the onset of the second phase of business performance from FY2011. This second period of business performance is from FY2011 to current times, which is characterized by increasing sales, improving profit margins, declining debt and rising cash reserves. During this period, the company witnessed the sales increasing from ₹9 cr in FY2010 to ₹83 cr in FY2017. The operating profits increased from losses in FY2010 to ₹32 cr in FY2017. The operating profit margin (OPM) increased from losses to 39% in FY2017. The company used the funds generated from improved business performance to repay its debt and it became a debt-free company in FY2017. In light of such marked change in the business performance of the company with FY2010 as the watershed period, it becomes essential that an investor understands the underlying reasons for the same. Looking at the above “Cupid Journey”, an investor would notice that until FY2010, the company dealt mainly in male condoms and supplied primarily to Govt. of India (GoI) whereas, from FY2010 onwards, the company started focusing on female condoms and started supplying to foreign governments. 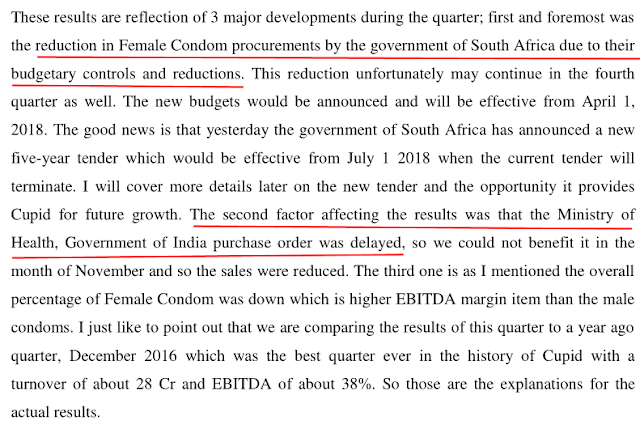 Therefore, an investor realizes that until FY2010, the focus areas of the company: male condoms and GoI orders were not remunerative enough and as a result, the company had to bear operating losses in years FY2009 and FY2010. However, the change strategy of the company to start manufacturing female condoms and focus on export markets/foreign govt. tenders bearing high profit margins has led to the revival of the company and as a result, the company is currently standing at a much stronger financial position when compared to FY2010. As a result, the company may report lower profit margins going ahead. An investor would notice that the company has realized that an entry in the B2C segment of direct sales to the customer is turning out to be harder than what it had originally envisaged due to competition. As a result, the company acknowledges that it will have to spend higher amounts on advertising and brand building that its earlier assessment. An investor would notice that because of higher spends to generate sales in direct sales to the customer (B2C); the profit margins in this segment are currently lower at 15% when compared to the overall OPM of the company. Therefore, an investor would appreciate that if going ahead the contribution of Govt. of India orders and direct sales to customers increase in the overall sales of the company, then the profit margins of the company may witness a decline. The tax payout of the company over the years has been primarily in line with the standard corporate tax rate in the country. However, going ahead, as per the company, it may witness lower tax payout ratio due to changes in the tax laws stipulating 25% tax rate for companies with turnover lower than ₹250 cr. Therefore, an investor should keep monitoring the profit margins of the company going ahead. While analysing the net fixed asset turnover (NFAT) of the company over the year, an investor would notice that the NFAT has improved from 0.43 in FY2010 to 5.25 in FY2017. An improvement in the NFAT indicates that the company is able to operate more efficiently and is able to generate a higher amount of sales from its assets. When an investor reads the previous annual reports of the company, then she realizes that the manufacturing capacity of Cupid Ltd had been much higher than the orders that it used to get. As a result, the company had low capacity utilization levels in the past, leading to low NFAT. In FY2015, the capacity utilization was about 52%, which improved to 64% in FY2016. The availability of unutilized manufacturing capacity ensured that the company could meet increasing orders from the existing capacity without incurring a huge amount of additional capital expenditure (Capex). As a result, the company could witness a significant improvement in its NFAT over the years. However, the has now reached maximum capacity utilization for segments like male condoms and as a result, it is doing capex to create more manufacturing capacities. The required additional investment in the fixed assets to generate higher sales from here on indicates that the NFAT of the company might not improve as it has done in the past. 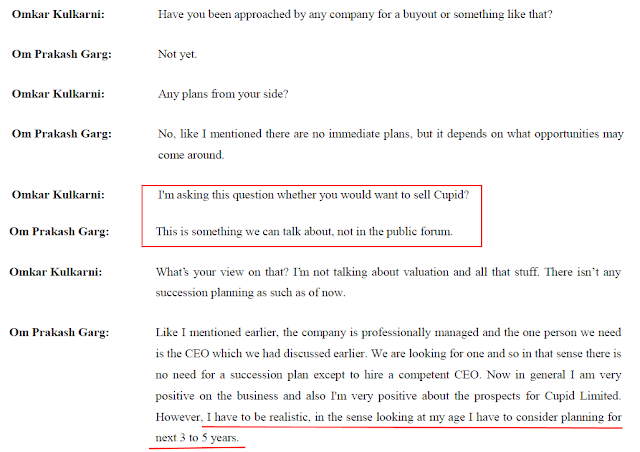 An investor should keep a close watch on the progress of the mentioned capex plans of the company. Looking at the inventory turnover ratio (ITR), an investor would notice that Cupid Ltd has been able to improve its inventory utilization efficiency over the years. The ITR has improved from 4.2 in FY2010 to 21.1 in FY2017. Such kind of improvement in the efficiency of the inventory utilization is an appreciable performance by the company. An investor would notice that the receivables days of the company have been fluctuating over the years. The receivables days deteriorated to 103 days in FY2010 and then improved to 26 days in FY2013 only to increase to 59 days in FY2017. While comparing the cumulative net profits (cPAT) with the cumulative cash flow from operations (cCFO) over last 10 years (FY2008-17), an investor would notice that Cupid Ltd has been able to convert its profits into cash. The company reported a cPAT of ₹43 cr during FY2008-17 and it could generate cCFO of ₹45 cr over the same period. Therefore, an investor would appreciate that the company has been able to manage its working capital requirements efficiently. An investor would notice that over the years, Cupid Ltd has witnessed an SSGR increasing from -17% in FY2011 to 59% in FY2017. An investor would realize that the key parameters leading to the significant improvement in the SSGR are the result of the change in the business strategy of the company post FY2010 as discussed above. The updated focus of the company to manufacture of female condoms and the focus on the export markets has led to better profit margins, a higher amount of orders leading to higher capacity utilization and in turn higher NFAT, all of which are inputs in the SSGR calculation. As a result, the company has witnessed its SSGR improve significantly since FY2011. As on date, the given business characteristics of NPM of about 25%, NFAT of about 5x and retained earnings of about 75-80% (considering dividend payout of 20-25%) seems sufficient to support a decent sales growth rate from the cash generated by the operations without putting any pressure on the capital structure of the company. While analysing the free cash flow (FCF) position of the company, an investor notices that over FY2008-17, the company generated a total cash flow from operations (CFO) of ₹45 cr and it did a capex of ₹12 cr over the years to grow its sales from ₹24 cr in FY2008 to ₹83 cr in FY2017. As a result, the company could report an FCF of ₹33 cr (45-12) over FY2008-17. The company seems to have used the FCF to service interest & repay all of its existing debt over the years and pay dividends. The surplus cash remaining after the above usage is available with the company as cash & investments of ₹19 cr at March 31, 2017. As per the annual report, wife of Mr. Garg, Ms. Veena Garg is associated with the company and fulfilling the criteria for a mandatory woman director on the board of the company. Mr. Garg is assisted in the business by Mr. Durgesh Garg, who is his brother’s son and Mr. Pawan Bansal, who is his sister’s son. As per the annual reports of the company, none of the children of Mr. Om Prakash Garg, if any, is a part of the management of the company. It seems that in light of the increasing age of Mr. Om Prakash Garg and absence of any of his children to take forward the central leadership of the company, Cupid Ltd is looking for hiring an external CEO. The company has been in a search of the CEO but has not been able to find a suitable candidate until now. The indication of the promoters’ willingness to let go of their business ownership gets strengthened when an investor notices that in FY2017, the promoters reduced their stake in the company by 3.59% from 48.46% at March 31, 2016, to 44.87% at March 31, 2017. In light of the same, it is advised that any investor should keep a close watch on the steps taken by the company for succession planning/ensuring smooth leadership transition for future. The primary business of Cupid Ltd is to supply to govt. /donor agencies based on the tenders floated by them. The tenders from these organizations depend a lot on the budget allocations and therefore, many times, the orders might not follow in continuity. This might lead to the periods where Cupid Ltd does not have orders to keep its facilities running and leading to lower sales revenue. As per the February 2018 conference call, the company faced a similar situation in Q3-FY2018 when the Govt. of South Africa cut down on its purchase of female condoms due to its budgetary controls and delay in the purchase order from Govt. of India. These factors led to the sales of Cupid Ltd decline to ₹21 cr in Q3-FY2018 as compared to ₹28 cr in Q3-FY2017. Therefore, in light of the nature of the business orders serviced by the company, an investor should be prepared to witness large fluctuations in the sale performance of the company over the periods. If an investor analyses the journey of Cupid Ltd over the years, then she would notice that the company got its shares listed on BSE in 1995, very shortly after its incorporation in 1993. Moreover, the company has disclosed that it started commercial production of male condoms in 1998 well after it went public in 1995. The fact of getting a company listed soon after incorporation without starting commercial production of the key products indicates that the promoter/entrepreneur wanted to offload the risk of the business as soon as possible on the minority public investors. Investors would remember that the period of the mid 1990s was the time when many companies were listed on Indian stock exchanges in light of relaxed statutory guidelines. Many investors remember this period as the time when promoters considered public money as riskless free capital (without payment of any interest), which is not to be returned ever. This led to a spurt of IPOs in those times. It is advised that investors should be aware of the timing of stock exchange listing of the company when they analyse the company. The company issued 2,650,000 warrants to the promoters in FY2011 (1,150,000) and FY2012 (1,500,000) at ₹10/-. As per the terms of the warrants allotment, 25% of the money was to be paid by the promoters at the allotment and the balance 75% of the money was to be paid at the time of conversion of the warrants within 18 months from the allotment. Many times, the argument provided in the favour of preferential convertible warrant allotment to the promoters is that the company is in dire need of funds and other outside parties like banks etc. are not willing to lend to the company. As a result, it is communicated to the minority/public shareholders that the promoters are helping the company by subscribing to the warrants as they are infusing the much-needed funds into the company at the time of liquidity crunch. However, we believe that the inherent transaction structure of the warrants where the promoters upfront pay only 25% of the money (at the time when the company is supposedly in dire need of funds) and the balance 75% of the money is kept in abeyance at a future time creates an issue. The company will receive the balance 75% of the money only when the promoters decide to exercise the warrants to convert them into equity shares at a later period. 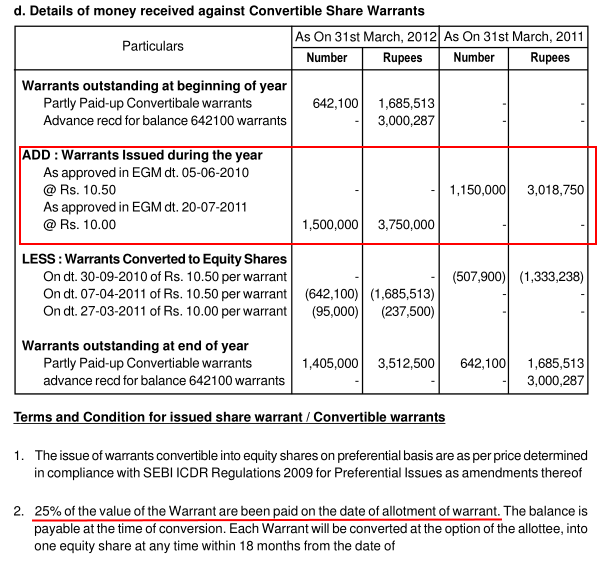 Common logic says that anyone holding warrants would not exercise them to get shares at a price, which is higher than the price at which he/she can get shares from the market. The entire gimmick of paying 25% at the time of allotment of warrants and then keeping the option to pay 75% at the time of exercise, which the promoters would decide based on whether at the date of exercise, the promoters are making money or not, seems like a facade to us. If the promoters pay 25% now and let the warrants expire due to the market price being consistently lower than the exercise price in future, then it effectively means that the promoters did not have the true intention of infusing 100% of the money. Or that the company did not need 100% of the money. It might be that the company needed only 25% of the money, which promoters put in by way of warrants allotment and the right to get shares in future at a discount is the payoff that promoters would enjoy as a consideration for giving 25% to the company. The company might not need the balance 75% at all. Nevertheless, we believe that if the promoters wish to infuse funds into the company, then the company should straight away issue additional shares to them at prevailing market price and get 100% of the funds upfront rather than letting the promoters speculate at the company’s share price by holding back 75% of the funds as happens in case of warrants. 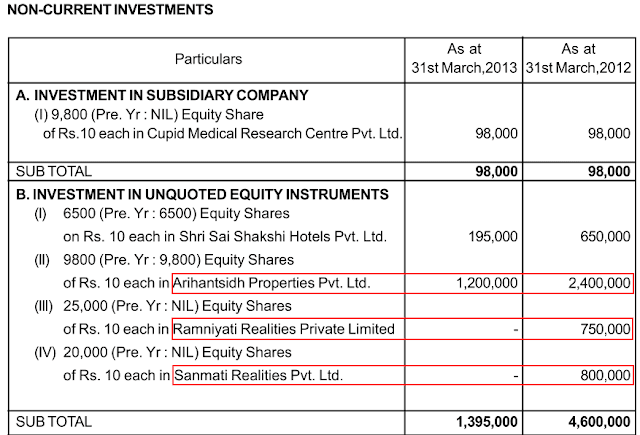 While analysing the non-current investments section of the annual reports, an investor would notice that Cupid Ltd had made investments of ₹0.24 cr in Arihantsidh Properties Pvt. Ltd. (APPL) in previous years. As of March 31, 2017, the company has completely written off its investment in APPL, which is akin to 100% loss of the money invested in the company. The company had written-off its investments in two other real estate entities in FY2013: Ramniyati Realities Private Ltd and Sanmati Realities Pvt. Ltd. It is advised that investors may seek clarifications about the nature of these investments in these seemingly real estate entities and the factors leading to their diminution of value. Moreover, it is advised to find out whether these entities are companies owned by persons known to promoters, who are not legally required to be classified as related parties in the annual report. This is because, if these companies are owned by known persons, then the act of first investing in these entities and then writing off these investments might tantamount to taking the money out of the company (Cupid Ltd). Currently (April 16, 2018), Cupid Ltd is available at a price to earnings (P/E) ratio of about 17 based on trailing 12 months earnings, which does not offer any margin of safety in the purchase price as described by Benjamin Graham in his book The Intelligent Investor. Overall, Cupid Ltd seems to be a company, which was facing tough times until FY2010 when it was facing operating losses and sustained high debt levels. 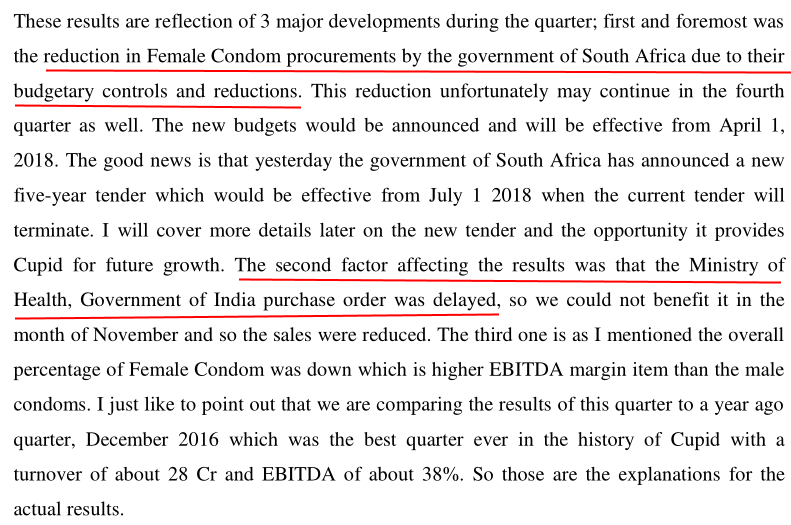 However, the company updated its strategy from FY2010 onwards by launching high margin female condoms apart from the low margin male condoms and focus on export markets instead of low margin Govt. of India contracts. As a result, the company witnessed a revival of its fortunes where it could grow its sales and profits multifold including a significant increase in profit margins and the company paid off all the debt to turn into a debt-free company. The company has been able to utilize its existing spare manufacturing capacity efficiently while keeping its inventory levels in check. As a result, the company has been able to grow its sales despite doing Ltd additional investments in its fixed assets (plant & machinery and working capital). The company has generated a significant amount of free cash flow (FCF), which it has used to pay-off debt, pay dividends and has kept the remaining as cash & investments with itself to fund future growth opportunities. The company seems to be facing a management success crisis as the current promoter CMD is getting old and none of the children is currently in the leadership positions of the company. The promoter is currently being assisted by his nephews in running the company. However, the company is looking out for a CEO, which it has not been able to hire yet. As alluded to in the conference call in February 2018, the promoters seem to be willing to cash out of the company in case outside parties make any suitable buyout offer. The promoters diluted their stake in the company by 3.60% in the previous financial year. The company’s business is dependent on the tenders from Govt. and donor agencies and therefore, is highly dependent on the budgetary constraints on these entities. As a result, the sales revenue of the company is prone to significant fluctuations. The company has been attempting to grow direct sales business to customers (B2C); however, it has been faced with challenges of competition and significantly higher spending needs to create a brand. As a result, the B2C business is yet to contribute significantly to the profits. There are certain aspects, which an investor gets to know upon analysing the company. The company got its shares listed on stock exchanges shortly after its incorporation without the commercial launch of its key product, male condoms. The company invested in a few seemingly real estate companies, where it, later on, wrote off the investment. The company had issued preferential convertible warrants to its promoters, which we believe is not the best of the methods to raise funds in the times of liquidity crunch. We believe that investors should be aware of these aspects and if feel appropriate, then they may seek further clarification about them from the company to make an opinion about the company. Going ahead, investors should monitor the company for operating profit margin, debt levels, receivables days, promoters’ shareholding, management succession planning etc. 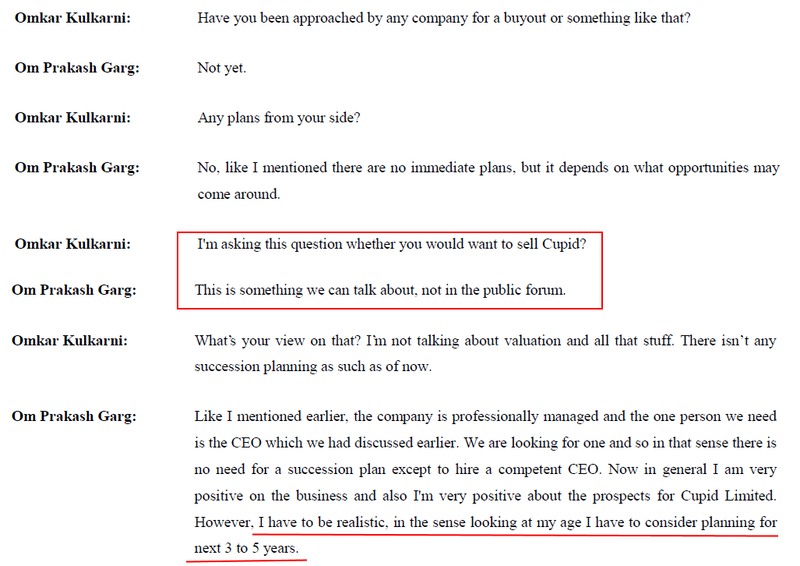 These are our views about Cupid Ltd. However, investors should do their own analysis before taking any investment related decision about the company.